I never had any interest in Follow the Leader because it always struck me as being even more meaningless than most magic effects. Then I saw René Lavand present his version. I started working on developing my own routine soon afterwards. My presentation, which is an adaptation of Rene's, is as follows. 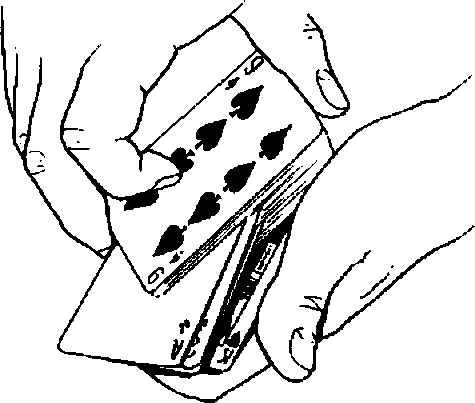 One of the things I've discovered performing sleight of hand is how even something as simple as a card trick can sometimes reveal a persons true character. For example, not long ago I was at the Estoril Cosmo in Portugal performing at a convention when, after the day s formal activities were over, I tuas as tad if I would be twilling to do something informally for a small group. I agreed and I decided to perform a card trick that I had done on many previous occasions using a group of ten red cards and also a group of ten black cards. I started talking about the differences between red cards and biack cards in weight, in texture, I had a couple of the casino s chips from the night before, so I used a black one and a red orte. I pointed out that this group of cards consists of one, two, three, four, fiue, six, seuerw eight, nine, ten black cards. And, of course, the black cards go behind the black chip, Similarly this grouf* consists of one, two, three, four, fiue, six, seven, eight, nine, ten red cards, And, naturally, the red cards go behind the red chip. Just then the waiter arrived with our drinks. As J turned around, I noticed in the mirrored wall behind me that the guy sitting over here reached across and surreptitiously siuitched the cards. When I turned hack, I didn't let on that I was wise. I just said, 'Remember, the red cards go behind the red chip, and the black, cards behind the black chif>." I saw the guy flinch so I decided to haue some more fun with hirru I called the waiter back on some pretext. Sure enough* I saw in the mirror that the guy took the bait He reached across and rapidly switched the cards. When I turned back I said, Tm sorry we keep getting interrupted. Where was 1? Oh, yes, I was explaining that the red cards go behind the red chip, and the black cards behind the black chip." At this point t/w guy couldn't take it anymore. He said, "Wait a minute. That's impossible!" He said, "Because I switched the cards."" "Switched the cards how?" I said. He said, "I switched the cards so they would be in the wrong places." "Oh, that doesn't matter," I said. 'The red cards always go behind the red chip and the black cards behind the black chip. "Even if I switched the cards myself 1 would still have reds here and blacks here. Because the red cards always go behind the red chip and the black cards behind the black chtf). Ttfo matter how many times I switch, I always have, reds here and blacks here. "No matter how many times I su>itch J always have red here and black here. "In fact, I can even take these cards one by one, take a black card and very deliberately place it behind the redst place the other black card with it Yet I always end up with reds here and blacks over here."